Please note: All UK or EU/EEA citizens are welcome to apply to attend the FTTL for any short-term period. For those desiring to come short-term who do not hold any of the above-mentioned passports, you may also apply, but are restricted to a maximum length of two weeks. For a longer stay you will need to have an appropriate visa that would allow you to legally reside in the UK for the duration of your stay in the FTTL. (Visitor’s visas are not acceptable for more than a two-week stay.) The recommended short-term period for all applicants is at least one full week. Many full-time trainees received their burden to be trained by visiting for a short period of time. Short-term trainees are fully integrated into the Training classes, teams, services, and houses for the duration of their stay. During the spring term, FTTL provides a special spring break program for university students who are considering joining the training. This unique program offers special fellowships and classes that short-term trainees would not otherwise receive. 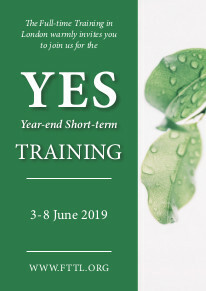 Please visit the YES Training section for more information and to apply. Short-term applications should be sent one week before the desired start date. To get the maximum benefit of your stay in the training, we strongly recommend you start on a Monday and finish on a Lord’s day for a minimum of one week. Short-term training accommodation and meals cost £26 per day, which could be broken down into £18 for bed and breakfast, and £4 for lunch and dinner each, per day. For short-term trainees who wish to stay in FTTL for longer than two weeks the prorated full-time monthly cost of £550 applies.